According to the National Institutes of Health, as many as one in eight people have sensitive teeth. Sensitive teeth can cause pain while drinking, eating, brushing or flossing. Hot and cold, sweet and sour beverages or foods may cause sharp and sudden pain in the teeth. Tooth pain can cause a person to avoid oral hygiene as well as drinking and eating which is needed to maintain a healthy body. Scheduling appointments with your dentist and maintaining good oral health practices is the only way to tackle the sensitive tooth problems. Sensitive teeth or dentin hypersensitivity, is caused when the dentin (the underlying layer of your teeth) becomes exposed do to receding gum tissue. The roots, which are not covered by hard enamel, contain thousands of tiny tubules leading to the tooth’s pulp. These dentinal tubules when exposed allow for pain to be felt with hot, cold, sweet or sour foods and liquids. What can you do to reduce tooth Sensitivity? Maintain good oral hygiene- Taking care of your teeth at home can help you maintain your dental health and prevent periodontal, or gum, disease from developing. Use a soft bristled toothbrush– It is recommended to use a soft bristle tooth, especially with sensitive teeth. A soft bristle tooth brush will help prevent eroding your gums because of brushing to hard. Use desensitizing toothpaste. Desensitizing toothpastes contain ingredients such as strontium chloride and potassium nitrate that help block the transmission of pain signals from the surface of your tooth to the nerve inside. In a nut shell, they block up the areas where the dentin in your tooth is exposed. Watch what you eat. Foods that are high in acid can erode the enamel of your teeth and expose the dentin. 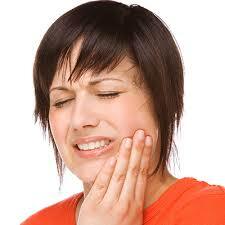 Also, food or drink that aggravate your teeth can cause swelling and aggravate the condition. Use fluoridated dental products. Fluoride Toothpaste and Mouthwashes prevent cavities. Fluoride accumulates in the demineralized areas and begins strengthening the enamel, a process called remineralization. Avoid teeth grinding. Teeth grinding can cause your teeth to wear, damage or be sensitive.A mouth guard is a great way to stop teeth grinding. See your dentist at regular intervals. Call the office of Dr. David M Glasscock to schedule regular dental check ups, teeth cleaning and dental treatments regularly. This entry was posted in Dental Health, Glasscock Dental and tagged affects diet, dentin, dentin hypersensitivity, Dr. David M Glasscock, Glasscock Dental, oral health, sensitive teeth, tooth sensitivity. Bookmark the permalink. What Impact Does Alcohol Have on Your Teeth? How do you prevent TMJ?